Members of Rio’s Student Senate traveled to the Collegiate Leadership Conference of Ohio hosted by Columbus State Community College, which brings college students throughout the state together to enhance their leadership skills. Pictured left to right are Student Engagement Coordinator Seth Lawrence, Sally Boblitt, Student Senate President Kaylynn Bell, Amanda Shy, Abby Wood and Alyssa Sullivan. RIO GRANDE — Students at the University of Rio Grande and Rio Grande Community College are working to create a difference in Ohio, supporters say. 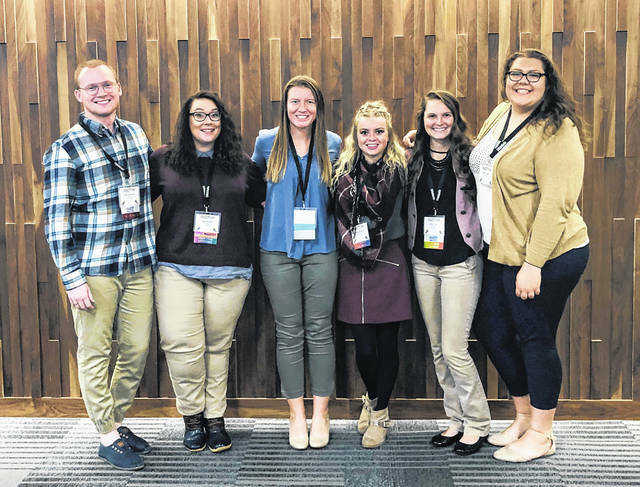 To learn new ways to achieve this goal and share their own ideas with other college students across the state, members of Rio’s Student Senate traveled to the Collegiate Leadership Conference of Ohio. The event is hosted by Columbus State Community College to bring college students throughout the state together to enhance their leadership skills with the leaders of different organizations and non-profits across Ohio. Student Engagement Coordinator Seth Lawrence said taking students to the conference is another way to prepare them for their future careers. Lawrence said the students enjoyed the learning opportunity, as well as the chance to be ambassadors for Rio among their peers from around the state.